"Lepšia hrst' priatel'stva, ako voz dukátov." This traditional Slovak saying translates to "A handful of friendship is better than a wagonload of gold," and as a YFU student in Slovakia you'll get to experience this sentiment for yourself! Ahoj! Are you interested in a unique European study abroad experience? Slovakia is a modern country with a sense of tradition that is rooted in the country’s history. Lacking the intense commercialism of Western Europe, Slovakia is a country full of hospitality and with a strong sense of identity. Slovakia's historical architecture includes many cathedrals, fortresses, and medieval town centers. Most towns have historic churches; these centuries-old, still-functioning wooden churches of northeastern Slovakia are some of the country's greatest treasures. If you are able to visit one, you'll see a true piece of living history! The Slovak National Museum in Bratislava contains exhibits on the country’s history, archaeology and passion for music - and you're sure to experience each of these first hand during your stay in Slovakia! Slovakia offers an impressive collection of national parks. The country cherishes its unique landscapes, which include the Carpathian Mountains that extend across most of the north. These mountain ranges include the beautiful and pristine Tatras - if hiking is your thing, be sure to check them out! Slovak families enjoy many outdoor activities from mushroom hunting to gardening at summer cottages. Some of their favorite summer sports are soccer and tennis while ice hockey and skiing are popular winter sports. Expect many of your new friends and family to be very involved in the outdoors and sports - there will be no danger of getting bored during your time in Slovakia! Students are kept very busy in school, whether it be at a Gymnasium, Economic High School, Technical High School or Vocational school. An emphasis is placed on extracurricular activities as well, allowing students to develop their interest in sports, art and drama. Spend some time learning more about the history, culture and people of Slovakia. And don’t forget what to do if you want to "wish luck" in Slovakia: instead of just crossing your fingers, fold the thumb in and close your fingers on it! By the time you're finished with your stay in Slovakia, you'll be "wishing luck" to return again soon! Most Slovakians enjoy ice hockey, spelunking, sailing, skiing, hiking, and soccer. Program tuition does not include personal spending money or school-related costs such as books and school trips. Slovakian high schools offer a variety of courses, and exchange students have some degree of flexibility when it comes to choosing their classes. Lots of YFU students take Slovak literature and history in order to learn about their new home! YFU Slovakia also offers a bilingual (English and Slovak) program, where students are placed in a bilingual high school and take classes in both languages. All students applying for the semester or year program must be available for a mandatory 3-day National Pre-Departure Orientation, which usually takes place in mid-July. This orientation is a required part of the program aimed at preparing students for their experience overseas. All students will participate in a one-day local pre-departure orientation in May or June. Your program in Slovakia will start with a three-day arrival orientation in Bratislava, the capital of Slovakia. It will be followed by an introductory language course. Here, you will study the Slovak language under the tutelage of a professional instructor and develop the language skills required to attend and be successful in a Slovakian high school. For year students, YFU Slovakia will hold a four- to five-day mid-year seminar in January or February, which includes a ski course (skiing is one of Slovakia's most important sports) and trekking excursion. During this seminar, you'll get the opportunity to experience some of Slovakia's favorite pastimes with other YFU students from around the world! Your program will end with a re-entry orientation, during which you will reflect on your experiences and say goodbye to the friends and family that you made while in Slovakia. All orientation costs are included in program tuition. YFU exchange students are encouraged to participate in school-sponsored clubs and teams, as well as any extracurricular activities offered by their host communities. Slovakia is renowned for its after-school art programs that it offers nationwide, and some students opt to apply to one of these schools upon arrival in Slovakia. YFU Slovakia also offers a range of cultural trips for an additional fee. During your academic program, you may participate in a trip to Krakow (Poland), travel to the Czech Republic to visit Prague, visit the Capital City of Hungary - Budapest (for a weekend trip), see Christmas Markets in Vienna (Austria) or visit local folk art and music festivals. More information about these expeditions will be provided upon arrival in Slovakia. Students on the bilingual school program have the opportunity to attend a high school where courses are taught in both English and Slovak. Students will be enrolled in the one of the best English Bilingual high schools in Slovakia and will attend most of their traditional classes in English, but will be enrolled in at least one Slovak language and literature course. Those in the bilingual high school program should keep in mind that they may be asked to pay for private school tuition of up to €500. December 1, 2001 - August 1, 2004. Students who do not meet this age requirement or will graduate from high school before the start of their program will be considered for admission on a case-by-case basis. Slovak. Previous language study is not required. 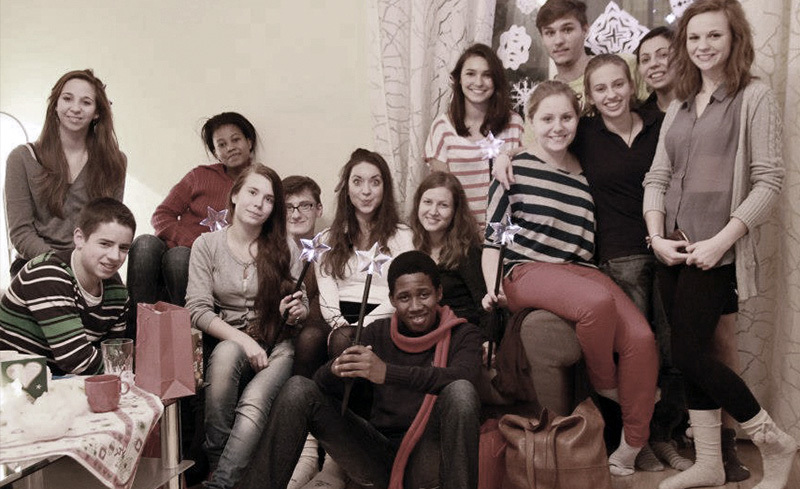 YFU Slovakia offers an intensive 4-5 day language course immediately after the arrival seminar at no additional cost. Students may be placed throughout the country in rural, suburban, or urban areas.